This textbook has been designed to meet the needs of B.Sc. (Hons.) 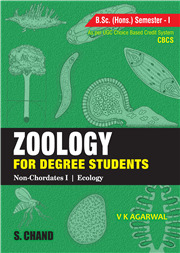 First Semester students of Zoology as per the UGC Choice Based Credit System (CBCS). Comprehensively written, it explains the essential principles, processes and methodology of Acoelomate Non-Chordates along with Protista, and Ecology. This textbook is profusely illustrated with well-drawn labelled diagrams, not only to supplement the descriptions, but also for sound understanding of the concepts.